Planet Labs has entered into an agreement to acquire the BlackBridge geospatial companies, including their RapidEye suite of core offerings. The asteroid mining company Planetary Resources is launching its first test satellite aboard a SpaceX Dragon resupply ship today. The Arkyd 3 Reflight (A3R) satellite will test out technologies for the company’s future spacecraft. 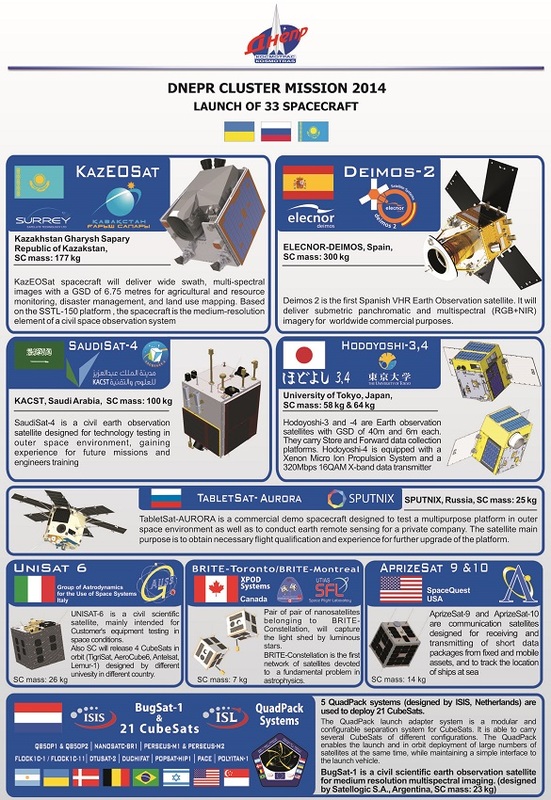 It will be launched from the International Space Station at a later date. The first Arkyd test satellite was lost when Orbital Sciences’ Antares launch vehicle exploded shortly after liftoff in October. The spacecraft was aboard a Cygnus resupply ship headed for the space station. 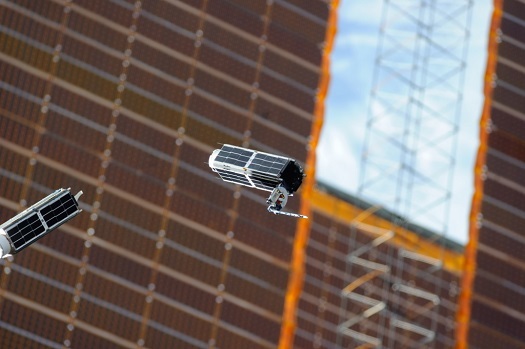 Planet Labs is sending up 14 more of its Dove remote sensing spacecraft aboard the mission. They are being launched as secondary payloads. Washington D.C. – The Commercial Spaceflight Federation is excited to announce the addition of two new Executive members and one Associate member. Webster, TX—January 13 2014 — NanoRacks successfully manifested payloads onto SpaceX-5 in record time: nine days. Historically, it takes months, years even, to successfully manifest a payload for delivery to the International Space Station. But that speed is too slow for the agile commercial space industry. NanoRacks was able to manifest CubeSats under a nine day deadline, and MixStix experiments in under one-month. That’s how little time there was to manifest payloads onto SpaceX-5 after the loss of Orb-3, and the company, working side by side with NASA and our customers, made it happen. SAN FRANCISCO — Planet Labs today announced a first closing of the majority of its $70 million Series C round led by Data Collective, with participation from new investors, as well as support from existing investors. Zachary Bogue, Data Collective’s co-Managing Partner, will join the board of Planet Labs. Planet Labs also closed a debt facility of $25 million from Western Technology Investment, bringing total financing this round to $95 million. 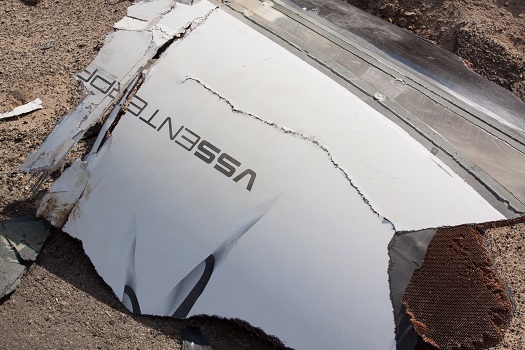 The year 2014 was one of steady progress and major setbacks in commercial space. Here is a rundown of some of the major developments and trends of the year. A later will look more closely at some of the companies in the industry. A Crash in the Desert. The tragic loss of Virgin Galactic’s SpaceShipTwo and death of Scaled Composites test pilot Mike Alsbury on Oct. 31 sent shock waves through the space community. The ship was ripped apart over the Mojave Desert about 13 seconds into a powered flight test when its twin tail booms suddenly deployed. Pilot Pete Siebold was thrown free of the wreckage and landed under parachute, battered and bruised but alive. Orbital Sciences Corporation’s Antares rocket exploded shortly after liftoff from Wallops Island, Virginia. The explosion destroyed a Cygnus freighter carrying supplies and experiments to the International Space Station. The explosion reportedly occurred about 6 seconds after launch. There was a massive explosion and then the vehicle fell back onto the launch pad. 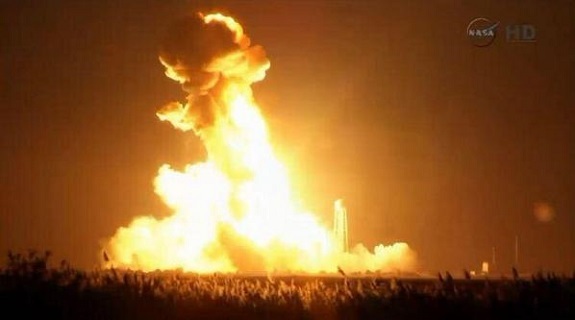 The Antares engines were throttled up to 108 percent when the explosion occurred. The bottom of the Antares explodes right after liftoff. Launch officials have confirmed there were no injuries in the explosion. All personnel are safe and accounted for at this time. The cargo manifest includes 26 Planet Labs satellites that would be launched off the space station. Planetary Resources also had its first test satellite aboard Cygnus. Thee were also a number of student experiments on the ship. NASA has the full manifest. 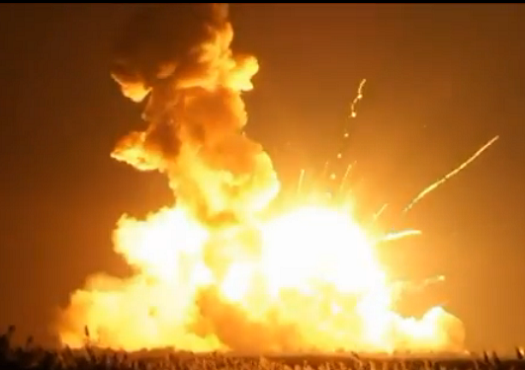 A massive fireball occurred right after the Antares rocket hit the ground. This mission was Orbital Sciences’ third contracted Cygnus cargo delivery flight to the International Space Station under an 8-flight contract. Two previous contracted Cygnus missions and a demonstration flight had succeeded. This was the fifth flight of the Antares rocket. Four previous flights had been success. Antares uses Arojet-Rocketdyne AJ-26 engines on its first stage. These are refurbished NK-33 engines originally designed for the Soviet manned lunar program in the 1970’s. There have been problems with corrosion on the 40-year old engines; one engine exploded on its test stand in May. The rocket’s first-stage structure is built in Ukraine. Antares second stage consists of a solid-fuel rocket supplied by ATK. My deepest sympathies to the Orbital Sciences team and all those with payloads aboard the vehicle. It’s a bad day, but these things happen in this field. This is the nature of this business. UPDATE: Orbital and NASA officials will have a press conference at 9 p.m. EDT (6 p.m. PDT). Video Caption: Space Station Live commentator Brandi Dean interviews Chris Boshuizen, co-founder and CTO of Planet Labs. This interview aired during Space Station Live on July 17, 2014. HOUSTON (NanoRacks PR) –Orbital Sciences’ Cygnus spacecraft successfully berthed to the International Space Station (ISS) Wednesday morning after launching Sunday afternoon from the Mid-Atlantic Regional Spaceport (MARS) at NASA’s Wallops Flight Facility. Onboard were 32 CubeSats and 10 internal payloads from NanoRacks’ customers holding dozens of research experiments onboard. Orbital’s Cygnus was brought to orbit by a two-stage Antares rocket. Cygnus was carrying 1,664 kg of supplies, CubeSats, and research experiments for the Space Station. Cygnus will remain berthed at the ISS for about 30 days where station crew will unload the experiments and other hardware. 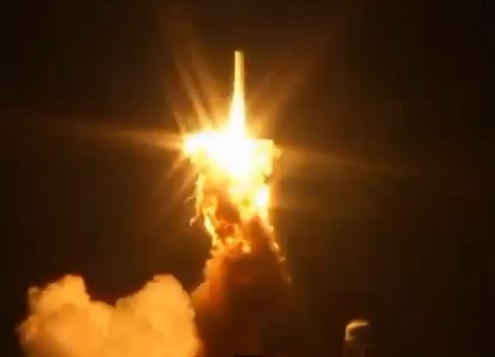 This was Orbital Sciences’ third resupply mission to the ISS, including their Orb-D1 developmental milestone launch. 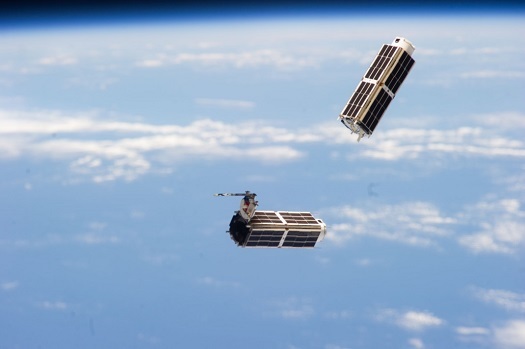 SEATTLE (Spaceflight Inc. PR) – Spaceflight Inc. and NanoRacks announced today that an additional 28 Planet Labs Dove CubeSats are en route to the International Space Station on the Orbital Sciences Cygnus Orb-2 Mission. The satellites were manifest via the NanoRacks Space Act Agreement with NASA, and are scheduled for deployment using the self-funded NanoRacks’ CubeSat Deployers manufactured by Quad-M Inc.
SEATTLE (Spaceflight Inc. PR) -– Spaceflight Inc., the company reinventing the model for launching small satellites into space, announces that it has successfully deployed 11 Planet Labs Dove earth-imaging spacecraft from an International Space Company (ISC) Kosmotras-operated Dnepr launch vehicle. A Dnepr rocket launched a record 37 satellites into space today from the Yasny Launch Base in Russia, including 11 Dove 1c remote sensing spacecraft for the American start up company Planet Labs. Company officials reported via Twitter that they had established contact with all 11 spacecraft on the first pass over the control center. ISC Kosmotras, the company that launches Denprs, said in a press release that all satellites were deployed into their intended orbits. 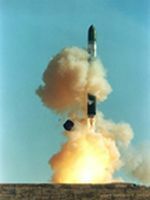 The rocket is a SS-18 ballistic missile converted into a satellite launcher with the support of Russian, Ukrainian and Kazakh companies, which are part of the ISC Kosmotras industrial team. The company last month hired Brian Holz, who was chief technology officer at O3b Networks, which has launched special satellites to try to broadcast signals that would power new Internet service in developing countries around the world. Google had previously made a financial investment in O3b and one of its employees sits on O3b’s board. The startup’s recently-launched satellites faced technical setbacks this year. Google also recently hired Dave Bettinger, who had spent 18 years at satellite firm VT iDirect, which supplies high speed broadband and other communications to military services and the oil and gas industry, according to people at Google. VT iDirect also suffered some product delays recently. Parabolic Arc has previously reported that Google is eying 1,200-satellite constellation that would provide global broadband services. There are also reliable reports of a deal with Virgin Galactic involving the LauncherOne rocket being developed by Richard Branson’s company. Google is closing in on a deal for Skybox Imaging, a satellite company that specialises in recording very detailed landscape pictures and video, TechCrunch has heard from three different sources. Google’s interest in Skybox, first reported in April by The Information, had already reached an advanced stage several weeks ago, with the two meeting in at least three rounds of acquisition talks, one source tells us. This was after people in the satellite industry started to hear rumors that Google was eyeing up Skybox, as well as another startup working in a similar area of satellite imaging, Planet Labs. We now have heard that the deal with Skybox “is happening,” with one person estimating the price at roughly $1 billion. The same source said that at Skybox’s last fundraising round, when it picked up $70 million in 2012, it was valued at between $500 million and $700 million. San Francisco, CA, March 17, 2014 (Planet Labs PR) – Planet Labs today announced that it has confirmed launches for more than 100 satellites over the next 12 months. The satellites will launch on rockets from the USA and Russia. This constitutes the largest constellation of satellites manifested in history. These new launches will build on Planet Labs first 28 satellites, Flock 1, which were launched in January.